This is a coupon for the Kinderbach online store. 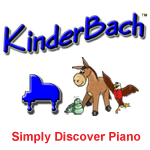 Simply discover piano with your child and KinderBach! Give your child the edge with a solid music foundation. 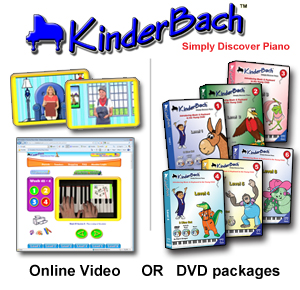 KinderBach uses playful characters to teach note reading, rhythm, singing, and composition - the best piano teaching system that maintains interest. KinderBach is a unique approach to introducing young children (ages 3 to 7) to music through entertaining videos, interactive workbook pages and parent participation. Karri Gregor, creator of KinderBach, has combined auditory, visual, kinesthetic and cognitive learning styles into each music lesson. Children will be guided by a delightful cast of characters from rudimentary basics to reading staff music. Students will learn music vocabulary, note reading, rhythm, physical technique, 'do, re mi' Solfége, listening skills and music composition plus the joy of making music. KinderBach is the perfect bridge between toddler music classes and private lessons on any instrument. KinderBach at Home offers two ways to experience the curriculum - through a series of DVDs or online streaming video, and through activity pages (downloadable PDF files) that capture the young ones' attention, that are both included with each method. The children will love the coloring, cutting, pasting and other simple tasks that reinforce the music theory presented in the videos. Play songs right away! For extracurricular enjoyment, KinderBach Songbooks help eager students (aged 4 & up) to get started in playing familiar tunes on the piano without a single lesson! Using a combination of the KinderBach pre-staff reading and playing by ear, students can play songs they know and love. Songbooks are printable from PDF files accompanied by an audio CD. The audio CD is complete with demonstration and performance tracks, allowing children to keep in time with a whole band. To learn more about KinderBach, visit their official website here.